Network administration can require performing a large number of tasks with a repetitive nature. However you can easily reduce their number by using the appropriate tools, such as VDISM for example. This portable tool allows you to create or edit Windows images that are used to backup and restore only certain parts of the OS. 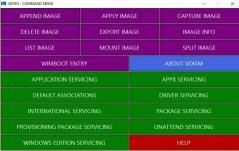 For VDISM to run properly, you should know your machine needs .NET Framework installed as well. The application was designed as a GUI for the Microsoft Deployment Image Servicing and Management command line utility, ensuring you can use its functions in a simpler manner. With VDISM you can create Windows image files that can be used to backup specific data stored on your computer such as files and folders without changing their original structure. Also, the same program lets you quickly and easily restore these backups at a later time. On top of that, you can use the app to edit existing image files which is useful for a large number of purposes. For example, you can replace old applications with their updated versions to your backups or simply add new drivers, software and packages so you can deploy them on multiple machines with very little effort.